PORT ORCHARD, Wash. - Feb. 12, 2019 - PRLog -- From David Hawk comes the third installment in this exceptional, imaginative adventure series about Neil and his best friend Marie who must travel across the universe through wormholes to save Neil's father and help finish the mission that his father set out to accomplish. In the third book, Neil and his father are reunited on the lifeless planet Flora, where Neil's father and Dr.Lowell were previously stranded. An explosion leaves Grandpa Al trapped on planet Flora, but an emergency forces the newly reunited team to leave, fleeing back to their shelter on Cylosis, where the ruthless State forces capture them, and Marie has gone missing. They rely upon their intelligence and the forces of the universe to escape certain death and complete their mission to Varillam, but first, the earthlings must escape imprisonment. The evolution of the human race hangs in the balance. 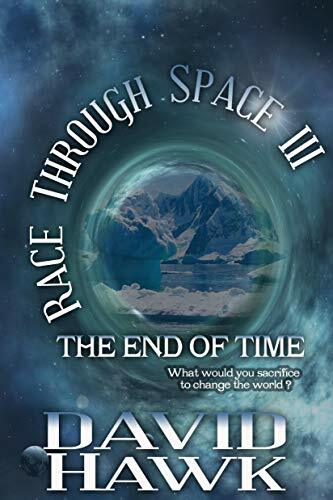 Race Through Space III: The End of Time is an action-packed adventure that brings you to incredible new worlds and introduces you to strange, alien creatures that are inspired by the real scientists who have shaped our understanding of the universe. Mr. Hawk was born and raised in Denver, Colorado where he lives with his family. He is an avid science enthusiast, a blogger, and is the creator of the LearnMeScience Facebook page and podcast. Mr. Hawk is the author of the Race Through Space series and the upcoming novel Across the Way.